Creating brand awareness is perhaps the most important part of building a successful, lasting business. In today’s world, brand awareness involves both the real world and the digital space and should be cultivated across multiple platforms to achieve the best and most comprehensive results. One of the best ways to be successful in your branding efforts is to communicate your business presence with the help of a mobile marketing vehicle. If you aren’t quite sure what a mobile marketing vehicle is, imagine a sort of showroom on wheels, and a trailer that opens up to reveal an exhibition of your company’s best samples on display. Mobile marketing vehicles can take you from being just another company in the crowd to the star attraction of any event you’re attending. At Advantage Trailer, we specialize in creating custom marketing trailers for the business of all kinds. If you’re interested in building brand awareness with a mobile showcase of your products, take a look at what can be accomplished with a mobile marketing vehicle, and how it can benefit your business goals. It goes without saying that every business is unique, and your brand’s trailer should reflect that. At Advantage Trailer, we are dedicated to building custom trailers that serve a specific purpose to build awareness with beautiful designs and strategic customization options. Concession Trailers: For when food is a major part of your identity you can’t go wrong with a concession stand in a trailer. Whether you’re a food truck, restaurant, or caterer if you feed them, they will buy more. Mobile Retail: Sell your retail goods from your mobile marketing vehicle – complete with ample storage, merchandise displays, retail transaction counters and more. Display and Exhibit: These trailers be perfect for those company’s who need to show and tell future customers about their products or services. The perfect method of delivering a demo awaits you with this option. Event Trailers: Turn your trailer into an interactive experience by letting customers play with your products – your mobile marketing vehicle is an engaging, interactive experience. Mobile Showrooms: Especially popular for companies like contractors and remodelers. This option allows a company to essentially bring the display factor and dial it to eleven so that customers can see needed solutions play out so they can be encouraged to commit right at the show. Stage Trailers: Whether you just want to provide music or a full visual performance, a stage trailer can provide the platform that can make you the showstopper at your next event. Wraps: Let your branding start with the graphics on your trailer. Recognizable graphics, logos, and eye-catching detail can draw customers like a moth to a flame. Keep in mind that no matter which type of trailer you choose, your selection can be customized to suit your specifications. Need the longest trailer possible for your showroom? No problem. Need a bar to go with your concession stand trailer? At Advantage Trailer, we can build it for you just the way you want it. Mobile marketing can take a variety of forms. That’s why at Advantage Trailer we offer a custom-built solution to match to your needs. Whether you need a small or large trailer, we have you covered. With our mobile marketing vehicles, you can be assured that you’ll be able to load up with everything from rooftop signs to foldout stage platforms. 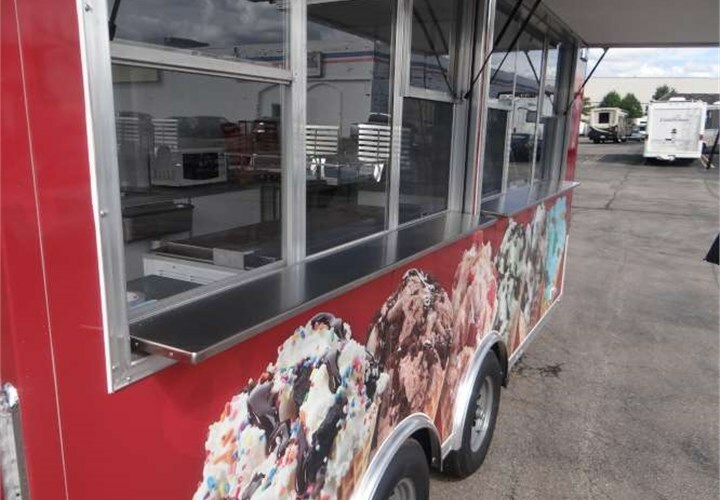 Our custom solutions will have you ready to roll whether you need a stage, mobile kitchen, retail trailer or any other mobile marketing solution – all designed to match the look and appearance you need for superior branding. Starting in 1989, we have been one of the leaders in the industry by providing a variety of trailers, accessories, and towing products for our customers. By staying focused on our customers, our success only continues to grow. Ready to roll your business onto the path of success with one of our gorgeous, brand-building mobile marketing vehicles? Give us a call to speak with one of our agents about our professional mobile trailer options or fill out our online form to schedule your free quote.